I miss a certain little boy. He was just a skinny little thing, afraid of his own shadow, afraid to speak his mind. He was a nice kid, at least thats what his momma said, whenever she got the chance. The little boy had two sets of grandparents, and they all lived just a few blocks away from the little guy. His parents were kind people who gave him all the love he ever needed. His mom and dad were very young and were able to do all sorts of fun stuff with him such as going for walks, camping, and just being there for him. The little guy had a few friends, but being shy and lacking confidence, almost nobody noticed him around. For years, he was an only child, but soon after, he was joined by three siblings who he loved to play with. The little guy befriended a few other kids who lived next door. These kids were not as fortunate as the little guy, having parents who treated them very cruel and mean. The little guy witnessed this cruelty, and it managed to affect him in very painful ways, even causing him to nightmare from time to time. As the little guy grew into a bigger guy, and then into a man, his life was not an easy one. Finishing school with lackluster grades, he chose to work in his dad’s profession rather than seek a college education. He married young, to a woman who was as cruel to him as his childhood friends’ mother was to them, and with the damages he received from that experience, and from his lack of confidence, he said nothing to his cruel wife. When his wife mentioned having children, the young man grew very excited. All he ever wanted was to be a dad, and to raise his children with as much love and kindness as his parents gave him. This would not happen though. The young man and his wife were not able to have children of their own. First his wife blamed herself, and then through intense tests, it was discovered that the problem laid with the both of them. She tried many procedures, some very costly, but in the end, the couple remained childless. Having placed the blame on the young man, she embarrassed him when his friends were around, calling him ‘half a man’ and crying at the sight of young mothers and large families. His feelings were hurt so badly, but she showed no concern, laying blame as a way of coping. The marriage did not last, and thankfully so. Things got so bad that the young man sought the advice of anybody who would listen, such as friends, and even clergy. Coming from a religious background, the young man told his story to his minister. He told of the horrors his cruel wife bestowed upon him, always blaming, always hurting him, and never showing any sort of love. The minister must have taken notice in the young man, as he warned that although the church did not approve of divorce, they also did not approve of suicide, and the minster feared that if the young man remained in this marriage, he may actually consider such an alternative. With this, the young man left his wife. It took many years for the young man to get over this incident. His confidence already lacking, he lived through the rest of the eighties, through the nineties, and on into the two thousands, always alone, bouncing from one relationship to another. Just when he was about to throw in the towel, the young man grew very sick. Doctors worked to revive him, to give him another chance. When the young man, now a middle aged man returned, he had a new outlook on life. He would no longer dwell in the past. He would move on, and do his best to succeed. With this, everything changed for him. The middle aged confident man met a beautiful woman who loved him with all her heart, and the two built a relationship that has lasted throughout the years. The middle aged man became a father to the woman’s son, and the three of them lived happily ever after. To anyone who does not believe in fairy tales, I say that they can happen, and that wishes can come true. All those years ago, I was that little boy, and I am now the happy middle aged man who is so proud of how his life turned out. If you ever doubt that true happiness is possible, just look at how my life turned out. There is always hope, you just have to remember to keep wishing, and it will come true if you believe in yourself. How bout some toothpaste here? Stupid me. 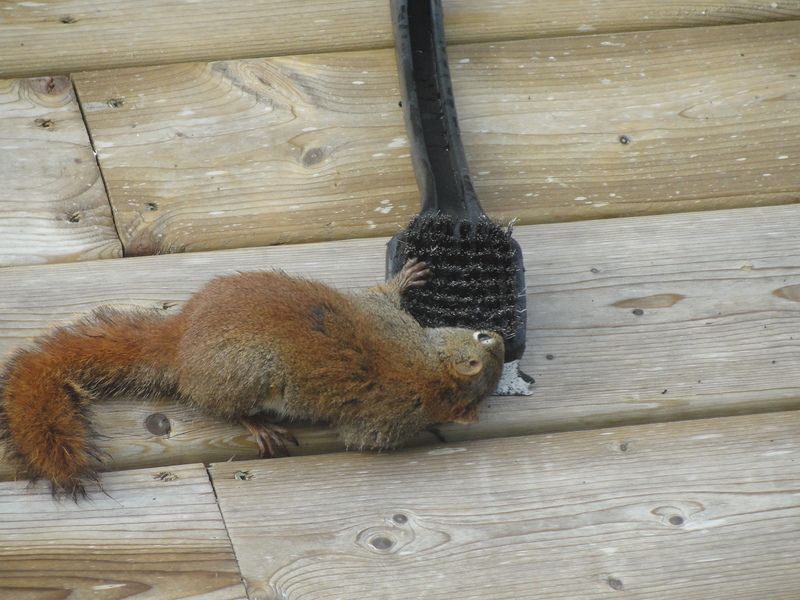 I mistakenly bought a squirrel toothbrush rather than a bbq brush. Like the KJ Hubby vs Robin battle, I now have my own man vs beast battle on the go. I can’t seem to keep BBQ brushes. This damn squirrel keeps sharpening his teeth on them, forcing me to throw them out and buy new ones…I may have to call in the big guns! Back when I was a kid, I loved comic books. My dad was also a fan. Dad would drive mom crazy by reading comics at the supper table, instead of talking to her. She hated comic books. There was a strange man who lived at the end of our road who collected comics. His name was Gerald. Whenever he bought new books, he would loan them to me. Because of that, I was the local expert on everything comic, with knowledge including everything Clark Kent was doing, how Donald Duck would solve the latest mystery, if Bruce Wayne was in a foul mood…you get my drift. My favorite comic was Superman and the Legion of Superheroes. In this one, Superboy would travel in time to a few hundred or so years into the future and join up with the superheroes of tomorrow. This made for some interesting reading for a kid, and perhaps led to the formation of some of my writing creativity. I also loved the classics. Dad had every Classics Illustrated comic that he could find, and we read them together during the winter months, when the weather wasn’t fit to do anything else. I laughed at the antics of the Pink Panther, shivered through Tales from the Crypt and the Boris Karloff comics, and I was amazed by the many oddities of the world in the Ripley’s Believe it or Not comics. I traveled with the crew of the Enterprise in the Star Trek series (Gold Key Comics) and rode on horseback along with Wyatt Earp, The Ringo Kid, and even Jonah Hex. Hell, I even acted like a millionaire, as I swam in my huge bank vault with Uncle Scrooge. Comics have changed so much since I was a kid. Nowadays the pages are packed with violence rather than entertainment, and the years of sitting and chuckling to a funny, or envying That Poor Little Rich Boy and spooking everyone with The Friendly Ghost are gone, left to a few campy and very dumb movies based on those classics. I pity this generation, they don’t realize what they are missing. Disney? you mean that mouse guy right? Last evening, my brother and I were talking about old times. When we were kids, we would anxiously await Sunday night, so that we could tune into The Wonderful World of Disney on CBC. Well, from time to time, Mickey and Donald dropped by, but most of the time, we were treated to family oriented programs that Everybody could watch and enjoy, not just the kiddies. With programs such as stories about lions and tigers, Bed Knobs and broomsticks, lost dogs and cats, Davy Crockett, and just about everything imaginable, the entire family were entertained by the genius of Walt Disney. We were allowed to explore undersea adventures, and we followed a caped crusader who carved the letter ‘Z’ each week. Tunes like Davy Crockett King of the Wild Frontier and Disney’s themes filled my head as I whistled the melodies, and I feel like I grew up with Kirk Russell and Annette Funicello and the rest of the mouseketeers, often feeling like I lost some childhood friends with their absence from the small screen. Things just aren’t like they used to be. Too bad. Nowadays, this type of entertainment has long since disappeared. If an adult want’s to enjoy a program with his kid, it seems that he has to put up with the antics of a rude sponge and a crowd of undersea creatures that drive the hell out of most sane individuals. We need another Walt Disney to restore family values. Sure you can take your kid to a movie and spend some quality time, but at home, it is getting more and more difficult to find suitable television programming for the kiddies. Still dealing with funerals and wakes and all that stuff, my friend invited me over to his place on Sunday afternoon. He said that he purchased a sporting event and he had a few guy invited, so bring beer and he would provide the snacks. I expected boxing or UFC or maybe a ball game, what I got was an afternoon watching Money in the Bank, a WWE wrestling event. I have not watched wrestling since I was a young(er) man. The show used to be called WWF back then, but through some sort of legal issue with the World Wildlife Fund, the brand changed to World Wrestling Entertainment. I used to enjoy watching greats like Hogan, Andre, and the other cartoon characters go at it in the center of the ring, boasting unbelievable arm sizes and outrageous costumes. And then there were the finishing moves. Hulk Hogan simply ran across the ring and dropped his enormous thigh across the throat of his poor victim, Andre the french freak giant with the big head (who once acted as Big Foot in an episode of the Six Million Dollar Man) who used to simply over power and over size his opponents. My favorite was Jake the Snake, who would end matches with the devastating DDT, in which he held the victim’s head in a reverse head lock, and pounded their forehead onto the floor. This move won plenty of matches for Jake, and NOBODY ever got up from that move. Oh, he also had a ten foot python in a bag, that he proceeded to allow to slither across the bodies of his slain victims. That stuff HAD to be real, how could you fake that? On Sunday, I seen wrestlers half the size of their proteges throw several DDT’s on their opponents, only to have them unscathed by the move. Did wrestlers develop hard heads throughout the years, or are the young guys unable to utilize the move correctly? Or was it all fake, right from the beginning. Sacrilege! What would my grandfather think? He watched wrestling and figured it had to be real, after all, it was TV. As I watched the event, I felt like I was part of a soap opera, with incredibly poor actors. The ‘sporting event’ featured story lines such as two opponents, one a champion (by the way, they have several champions, shouldn’t there be only one, like in the old days?) facing the former champion for the love of a girl (who just happened to be the referee for the match). The show also featured two matches where a briefcase was suspended high above the ring, and wrestlers had to climb tin foil ladders to grab the brief case, the winner receiving a chance to ‘cash in’ the brief case anytime they chose, for a crack at the title. I know those guys are bit, but they tossed the ladders around like they were made of paper, some even breaking in two with impact from another wrestler’s head being drove into it. I have an aluminum ladder, and there is no way to crack the thing (although I never tried driving it into someone’s head, that might break it) so my only answer is tin foil ladders. One of the wrestlers, The Big Show, weighs in at over 500 lbs, and is quite agile for such a big monster. He brought in his own ladder, possibly the only real ladder, only to lose to a smaller man. As much as I wanted to believe this stuff was real, it was far too fake to fool anyone…except for the guy in the ball hat who sat next to me. He jumped and yelled when his favorite wrestler was in action, almost cussing when he lost. The drunker my fellow ‘fans’ got, the more they believed the stuff; looking at the crowds of fans who surrounded the ring, I noticed something. Most of the fans were in their late 30’s to their early 50’s. Maybe it is me, or there are many gullible people out there who actually believe the stuff, or perhaps they are like me, and just enjoy the hype and the excitement of a good show. In the end, I had a good afternoon and it helped keep my mind off all the sadness that surrounded me on Sunday. Thanks to my friends for thinking of me on that day. My regrets go out to the guys who were used as battering rams to break ladders with their heads. My mom called on Thursday to talk a little about her experiences with her mother in law. She said that Gram was the most loving, fun person she had ever met. Mom spoke about the times when my grandmother invited everyone to her house. She would cook up a big pot of homemade beans, and along with her delicious home made bread, she fed everyone who attended her parties. 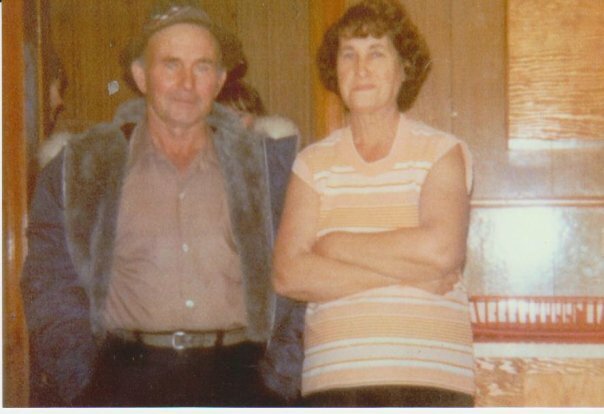 She would make sure that she invited all the local talent, and with squeezeboxes, guitars, fiddles and more playing traditional tunes, my grandmother would get up and step dance to every song. Mom said that gram was a very energetic woman who always found the good in everything and everyone. Mom recalled one occasion where she, my dad and my grandmother traveled many miles in the back country to pick bake-apples (a local berry that grown in abundance here on the island) . They were in the middle of the bog when a thunder and lightning storm broke out. In the pouring rain, mom and dad ran for cover, only to find my grandmother on her knees, laughing to kill herself at the two of them, as they ran in circles looking to take cover. Mom remarked at how she had met Gram. My aunt Joan was getting married, and being my mom’s older sister, she asked my mom to stand up for her at the wedding. Mom still remembers the tall lady who came over and welcomed her into the family. The wedding was one that was remembered for quite some time, as my grandmother catered the entire event herself, complete with lavish meals made from fresh vegetables from her garden and steak from the many cattle they raised on their farm. My grandmother was quite the lady. My mom commented on how intelligent my grandmother was. She could cook anything, she made clothes for all her eleven children, she had gardens that reaped only the best vegetables and fruit, she even spun her own wool, and knitted winter clothing for not only her children, but for my grandfather and many of the people in the community as well. And she did it with love. My dad has been devastated by the damages caused to his mother by Dementia. Since contracting the disease, my grandmother has even forgotten who my dad was on several occasions, and this cut deep for my father. My dad is not one who discusses his feelings often, so when he admits that he is hurting, it affects us all. The positive thing here is that my grandmother is now at rest, and hopefully in the loving arms of my grandfather once more. On Saturday night, my dad spent the night next to his mother. She experienced trouble breathing all night, and although he felt helpless, he remained by her side, along with his many siblings. On Sunday afternoon, exhausted from the effects of the disease that stole her from us, my grandmother closed her eyes, and peacefully, she left this world. I visited her home that afternoon, while she lay still in her bed. I paid my respects to the kindest person I have ever known. When I got home, tears fell as I thought about all the good things and lessons I was taught by my grandmother. This minute, my grandmother is happy, and by the side of her faithful husband, Teddy. This is where my grandmother prayed to be ever since my grandfather passed away. requesting a song she never danced to, changing the pace of the music. so I sit and play more, and they disappear again. Gram’s favorite song was “Will you love me when I am old and feeble”. I believe it is an old Carter Family tune. She asked for it specifically when she and my Grandfather celebrated their 70’Th wedding anniversary. She mentioned it again the last time I spoke to her. My girlfriend and I love gadgets. Me especially, and I believe my love for gadgets has spilled onto her as well. One gadget that she enjoys is one that I hate. 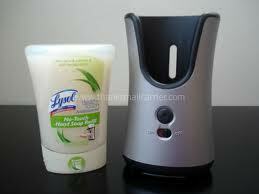 The Lysol soap isn’t much better a product. Rather than moisturizing, it dries out skin, and it doesn’t do much a job at cleaning either. The makers of this product do know how to promote a product though, I will give them that. The soap refills are available in ‘girly’ scents such as vanilla, apple pie, etc. I have a plan though. One day while the girlfriend is at work, I plan to disassemble that damn soap dispenser, and ‘fix’ it……I will keep you posted! When we were kids, mom always had the best cures for whatever ailed us. When we had headaches, she would get a cold facecloth and place it on our foreheads, and with her kiss on the cheek, the headache would magically go away. If I had a toothache, she would put a few cloves in the cavity, and the pain would go away until morning, when the dentist would take care of the tooth. If I had a stomach ache, she would take a bottle of Seven-up, stir it until it went flat, and then give it to me in a small glass. Somehow drinking flat Seven-up made it all better. All day today I have been suffering from Kidney Stones. I haven’t passed any yet, but I can feel the damn thing in my groin, and I have been suffering the side effects throughout the day, which includes headache, nausea, and a very sore stomach, along with the fear of actually passing the stone. Mom has been calling all day, making sure that I am alright. The last time I had to pass a stone, I had to ask my parents to give me a ride to the emergency ward of the hospital, so that the on-call doctor could give me two shots of demerol to ease the pain. Tonight, mom asked whether my stomach was okay. I said that the stomach pain was at its worst. What did she recommend? That’s right, Seven-up. “Make sure to stir it to flatten it first” she said, still in the loving way she always portrayed. Thanks Mom, it worked. I may just be able to have a good nights sleep.